I thought instead of penning another Top 11 things for Online Marketing for Lawyers in 2017, I thought I ‘d write a post on what inspires the way we do business at Mockingbird. 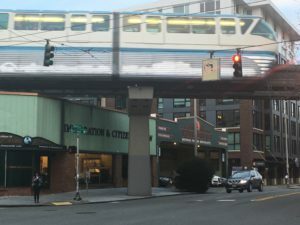 Fat City – located under Seattle’s iconic World’s Fair monorail. In the past 12 hours I’ve had interactions with two different local companies that have inspired me over the past 5 years or so. One is Tutta Bella, a small local pizza chain – the other Fat City German Cars, a single location, independent auto service shop. I’ve been a repeat customer with both of them for years and every time I go, I’m inspired to make Mockingbird more like this restaurant and auto shop instead of other online marketing agency. Fat City is unlike any other mechanic you’ve ever been to. Buttoned up. Squeaky clean. Impeccable service. Punctual. Even their facility – located in a historic building near the space needle – screams “we are so much more than local dealer”. Fat City stands out in an industry renowned for sales upsell chicanery. Benchmarking within your own industry makes you just as good as they are. But it doesn’t inspire going above and beyond to reach for greatness. Greatness that creates unexpected moments of inspiration for your clients or prospects. I once watched a chef at Tutta Bella pull a gorgeous pie out of the oven and dump it right in the garbage. Well, it looked gorgeous to me – but to the chef, imperfect. Expertise and Excellence should be an obvious requirement for online marketing agencies, yet very few invest in the training, persnickety attention to detail and sense of ownership required to truly be experts. I used to drive an old, beat up VW Jetta, that I suspect was the first to get off the production line when VW moved their operations from Germany to a brand new factory in Mexcio. The car was a disaster and I would bring it in to Fat City to ask Lance what to do. Now there was always a litany of issues that could be addressed, but Lance would always help me figure out what had to be addressed. “You can get another 6K miles on these brakes, but you have to fix the…..” Lance knew his job wasn’t to maximize his share of my car repair wallet – it was to keep me on the road (and safe) within what I had to spend (which frankly was – “as little as possible”). Bedside manner is that important yet rare ability of a doctor to explain things in plain English. Bedside manner applies to mechanics and SEOs as well. I recall picking up the Jetta at Fat City one day – they had saved the worn out parts of the wiring harness (apparently a car item that very very rarely fails, but did so in my car’s case) and walked me through what was wrong with them. Being able to translate the highly technical nature of what we do, into simple business terms is key to our communication at Mockingbird. Being Awesome requires Awesome people who are thoroughly inculcated into your culture, and methods. I recognized Leslie, the manager at Tutta Bella, yesterday as the server who we had been our regular a good 5 years ago. (And yes, I know both Lance and Leslie by name…. little things matter.) After a few years she disappeared from the restaurant, so I asked what she had been doing. Turns out, she had been tapped to open one of their new restaurants, got that up and running, managed another one for a year and then returned to the one where we had first met. The only way to turn great people into awesome people is to a)have them around for a long time and b)train them like crazy (especially in the constantly changing world of technology). Oh – and the company itself? Fat City’s been around since 1973. There’s a level of excellence that comes with specialization and longevity… kind of like and legal SEO starting out in 2006. Great firms know what to give away, and what to charge for. When the Jetta finally bit the dust I spent some time research and shopping for used Audis. Found one the exact one I wanted 400 miles away and had it checked out by a dealer who sent me a written report that I didn’t understand at all. Lance didn’t charge me a dime to review it. So today, I drove past thee Audi dealerships, with their certified Audi professionals to an inconvenient part of town to drop my new car off with the only mechanic I’ve ever trusted.